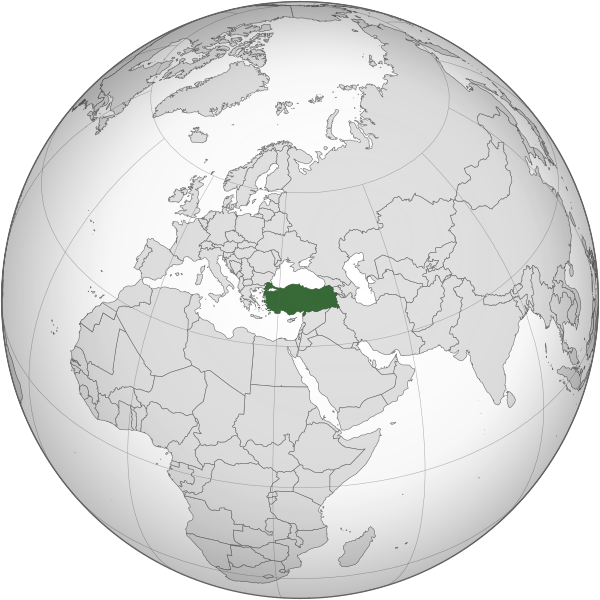 English: The orthographic projection map of Turkey. This illustration was all made by TheEmirr, not created by modifying any image. The other orthographic projection maps. Türkçe: Türkiye haritası. Bu görsel tamamen TheEmirr tarafından tasarlanmıştır. Başka bir görsel üzerinde oynanarak üretilmemiştir. 23.24, 16 Mart 2015 553 × 553 (296 KB) Flappiefh Removed Somaliland and Kosovo. Separated Western Sahara and Morroco. 16.25, 4 Ağustos 2013 553 × 553 (301 KB) Flappiefh Added South Sudan. 10.22, 11 Ağustos 2012 680 × 680 (235 KB) The Emirr The outside border is thinner. 10.20, 11 Ağustos 2012 680 × 680 (235 KB) The Emirr Update.